In 5th Grade with Teacher Julia: A Peek at My Week - LINKY PARTY! 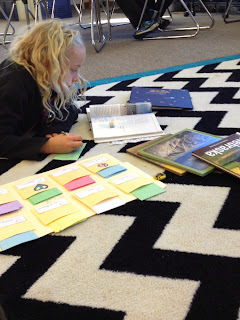 I am linking up with Mrs. Laffin's Laughings to take a peek at teachers' weeks! 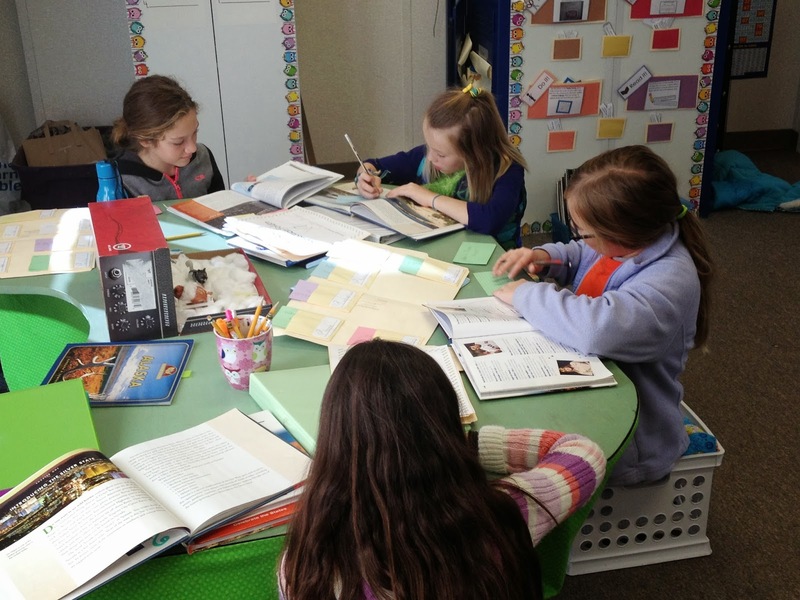 Research Writing Started! I am super excited about this unit! First of all, I love Alaska, and hope to visit there one day. I came really close to spending a school year teaching there, but decided that since I really hate the cold and straight cold AND darkness probably wouldn't be the best thing for my psyche, I created units of study on the subject. 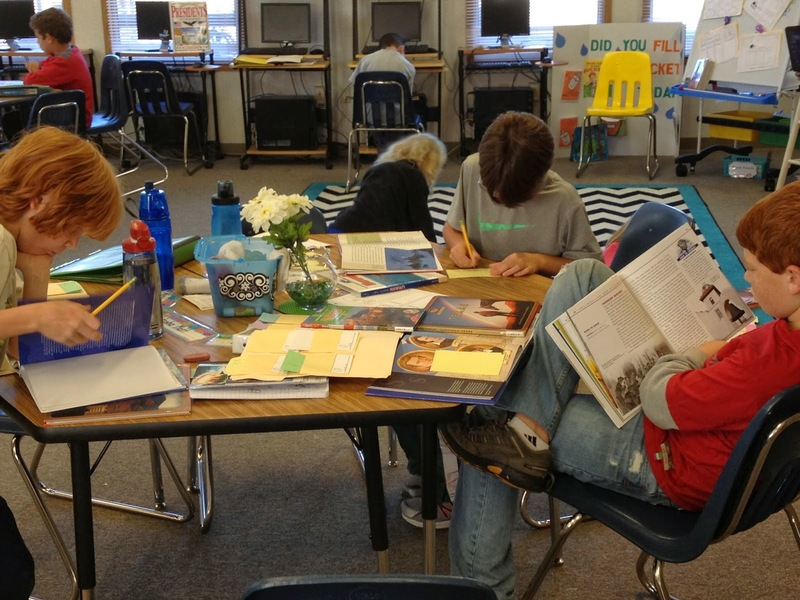 I also take pride in my organization skills and love the set-up I created for students. 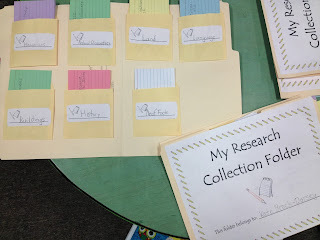 I came up with the Steps for Research that I think makes the most sense and can be used throughout students' entire lives, and Research Collection Folders which is the way I am guiding my students through the Steps of Research. 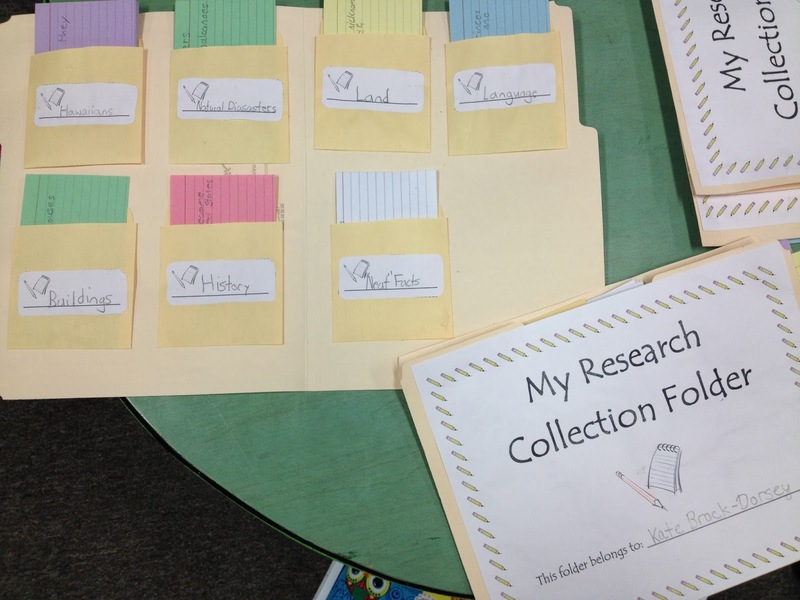 The folders are the "Brainstorm" part of the Writing Process where students list questions, categorize the questions to create the categories of study within their topic, and collect facts for each category. For example, all of my students are researching a different US State, their topic. 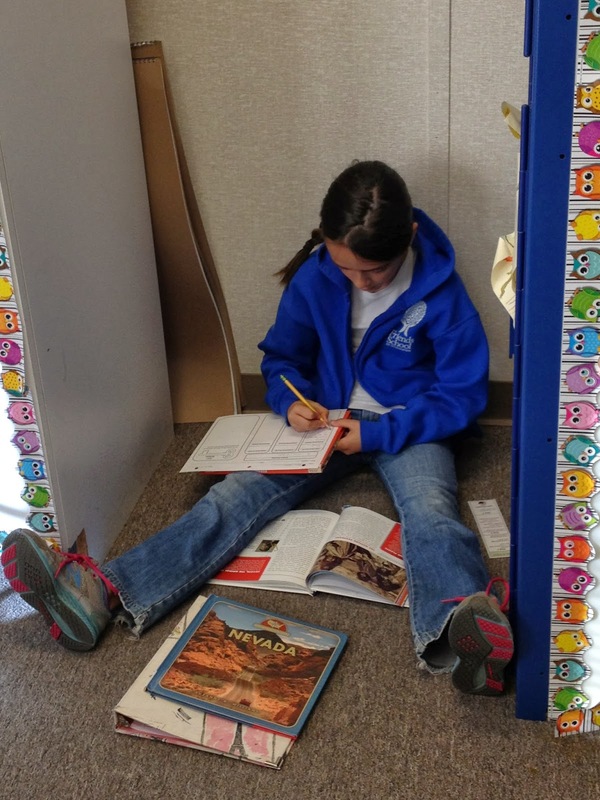 One student is studying Nevada and decided on Life in Nevada as one of her categories. She has a bunch of green index cards with the questions about life there (one question per index card). Eventually, students decide on which 3 categories will become their Body paragraphs in the essay. This is done based on which categories they gathered lots of facts for. 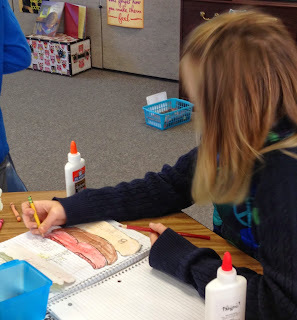 Interactive Notebooks! So this is how it goes, one day the Interactive Notebooks are awesome and really meaningful learning is going on, the next day, I feel as though it is so much "constructing" we run out of time to really spend on the teaching part of it all. I am reflecting each time on what it is that creates this difference. One thing I decided is that the less "parts" to the page there are, the better! From now on, one of the things I will do when planning my Interactive Notebooks is make sure I don't have a lot going on with the construction of each page. I really want to have a lot of time on the part where kids are reflecting on what they learned and "proving" what they learned. Any ideas out there for how to better my time when I use Interactive Notebooks? 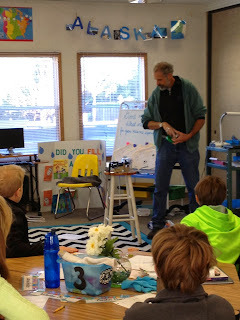 Science Experiments Week 1! 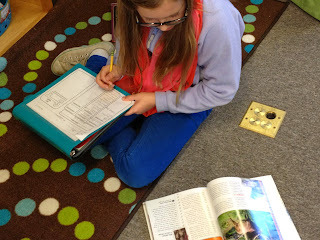 I assigned a science experiment for my students to complete as part of the culmination of our state research unit. Their job is to do an experiment that relates to their state in some way. One student is studying Wisconsin, and trying to decide on an experiment that relates to cheese. Another student is studying Texas and wants to do something that relates to the effects of greenhouse gases (Texas apparently lets off the most in the country). I will admit that I am not the most scientifically inclined person, so I asked our Middle School Science teacher to come in and speak to us about how to think about an experiment, etc. Man! Was I reminded of so much! 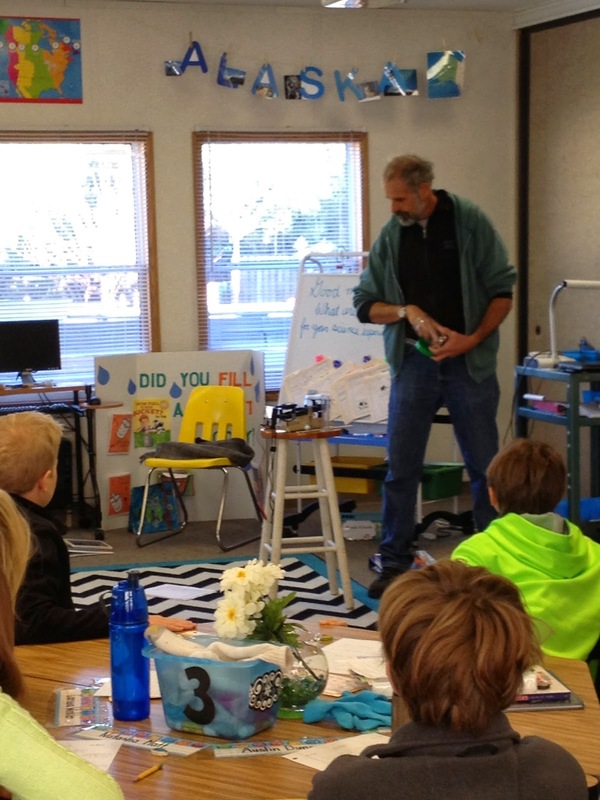 He talked about INDEPENDENT VARIABLES, DEPENDENT VARIABLES, CONTROLLED VARIABLES, how to graph data, predictions, inferences, the works! He even came with a handout for the students! I am really lucky to work with such a great teacher! In the meantime, while the students are home putting together their projects, I will be in the classroom demonstrating the entire process of what I expect from them with my own little experiment that relates to permafrost. Will the amount of blankets I put over ice "insulate" it so that if it were permafrost, I could use it as a refrigerator? So to think of it like a SCIENTIST, I will need to think what my variables will be and so on! I got my trifold board this week! Very exciting stuff! I a little bit nervous about pulling it all off right before Christmas break. I am asking for help from my parent volunteers. 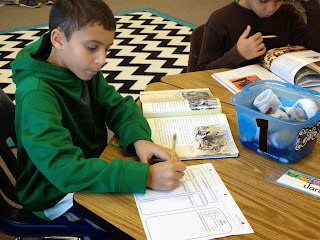 I am thinking a State/Science/Holiday/Winter theme..
Our Read Aloud - JULIE Our class just finished our first whole class literature circle with Julie of the Wolves, by Jean Craighhead George. One of my students gave me the fabulous idea of reading the sequel! I am not even 15 pages in because of the awesome conversations we keep having about Julie's conflict of wanting to accept her life with her father and also wanting to hold onto her Eskimo heritage. Her father is now married to a white woman, a gussak as the Eskimos say, and so that also brings up a lot of issue for Julie. And of course, since there is some learning of Alaska under their belts now, students are able to really connect with the vocabulary and have a much better sense of the setting. This was such a great idea, I am glad I have such smart students! My Units of Study are "PUBLISHED" I finally finished completing my Readers' and Writers' Workshop Units that I am using in the classroom! It was such an awesome feeling to print out all the pages and have them bound! I can easily just flip to the lesson I am teaching and copy the organizers, or make notes on the side, or even just highlight page numbers and things like that as I prepare for the next day! I am planned and ready all the way up until December 18! I am really proud of this, and can't wait to start the next unit which will be Biographies and looking back at civil rights of all types of people (Native Americans, Japanese Americans, Black History, and the Rights of Students with Learning Disabilities)! For now though, I am enjoying this because it is a huge accomplishment for me! What was your week like? Did you have as much fun as me?? I hope so! !